Measures Top and Bobbin Thread Tensions for All Home & Industrial Machines, regardless of bobbin size or no bobbin at all. So it will work for all your sewing, quilting, embroidery, serger and blindstitch machines. This upper thread tension gauge is a great tool for finding and setting consistent thread tensions on your top threads! This thread gauge allows an embroiderer to adjust top embroidery thread tension. The Tajima thread tension gauge will work with both commercial and home embroidery machines. The thread tension gauge is hooked to the top thread from the presser foot and by pulling on the thread the embroiderer can determine the tension the embroidery machine is exerting on the thread. The embroiderer can then adjust top tension until the desired level of tension has been attained. 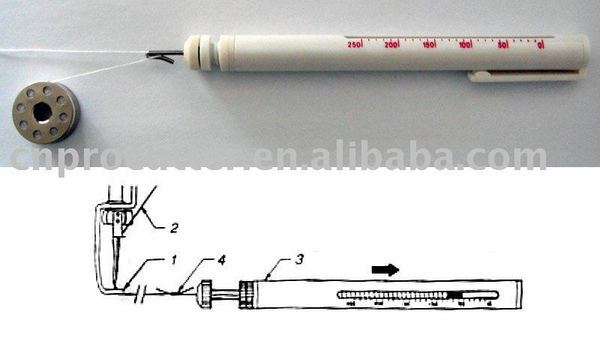 This simple to use pen type tension gauge is suitable for both top thread and bobbin thread tension settings. Ideal for commercial and home machines. Recommended tension settings for Glide Polyester thread are between 90-110 grams. Time Saver - no more wasting precious time trying to set tensions. Top Thread (Rayon 120/2 or tkt. 40) Tension Value 100-130. Top Thread (Polyester 60/3 or tkt. 40) Tension Value 110-150. Underthread (Polyester 120/2) Tension Value 20-35. Madeira Rayon thread usually should run between 110-125 grams. Madeira Polyester thread usually should run between 115-130 grams. This thread gauge allows an embroiderer to adjust top embroidery thread tension. The Tajima thread tension gauge will work with both commercial and home embroidery machines. The thread tension gauge is hooked to the top thread from the presser foot and by pulling on the thread the embroiderer can determine the tension the embroidery machine is exerting on the thread. The embroiderer can then adjust top tension until the desired level of tension has been attained. - Madeira Rayon thread usually should run between 110-125 grams. - Madeira Polyester thread usually should run between 115-130 grams. Using thread tension gauges makes it easy to adjust both bobbin and upper tensions. It's quick, easy and will help you eliminate unsightly bobbin thread showing on top, looping top stitches and thread breaks. Your embroidery will look its best with consistent, balanced thread tensions. Here's how to use a top embroidery thread tension gauge to take the tension out of setting tensions! Pull approximately 6 inches of thread through the needle and presser foot. several times so it won't slip). Steadily pull the gauge towards you with the window of the barrel facing up. As you pull, take note of the reading. These represent tension readings in grams. Polyester threads require higher tensions than Rayon. Polyester tensions 120 to 150 grams. Rayon tensions 100 to 120 grams. Adjust your machine main tension knob until you get the desired reading. After my interaction with your staff, Allbrands is the first place I go to look for embroidery supplies. . I was extremely pleased with the speed of full filling my order. It arrived just a few days after I placed my order. I will order from you again.